Científicos ingleses han descubierto en Egipto un dedo gordo artificial en el pie de una momia que sería la prótesis funcional más antigua del mundo. Investigadores de la Universidad de Manchester, en el Reino Unido, señalan que el dedo, de cuero y madera, actualmente en el Museo del Cairo, ayudaba a su dueño a "caminar como egipcio". El equipo científico espera demostrar que el dedo gordo artificial del pie derecho es anterior en varios siglos a la prótesis de una pierna artificial que data del año 300 a.C., la más antigua conocida hasta ahora. El Museo Británico también tiene en exhibición la prótesis de otro dedo similar pero ésta no está adherida a su pie. "Los dos dedos datan de entre 1000 y 600 a.C. y si podemos demostrar que uno o ambos eran funcionales habremos hecho retroceder el nacimiento de la medicina protésica en unos 700 años", manifestó Jacky Finch, del Centro de Egiptología Médica de Manchester. El científico señaló que el dedo prostético que se exhibe en El Cairo es probablemente más funcional por cuanto está articulado y muestra signos de uso. Los científicos buscan ahora personas que tengan un dedo protésico para tratar de comparar la funcionalidad de las extremidades modernas con las egipcias antiguas, e intentar hacer una réplica de la prótesis encontrada en la momia. (2) Is 'Cairo toe' the first practical prosthetic? Academics want to test an ancient fake big toe to see if it really did help its owner to "walk like an Egyptian". 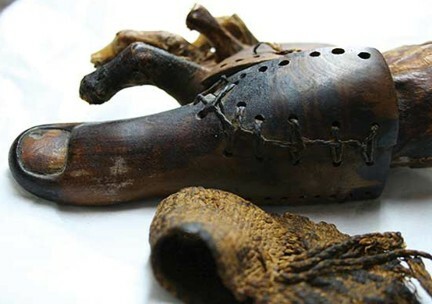 They have made a replica of the "Cairo toe", a bending leather and wood body part which they believe could be the worlds earliest practical prosthetic. Now they are seeking volunteers who themselves lack a right big toe, to test their theory that it actively helped its original user to walk. If proved correct, it would mean prosthetic medicine started at least 700 years earlier than previously thought. Jacky Finch, lead researcher at Manchester Universitys KNH Centre for Biomedical Egyptology, said the fact that it showed signs of wear indicated it was a practical limb. 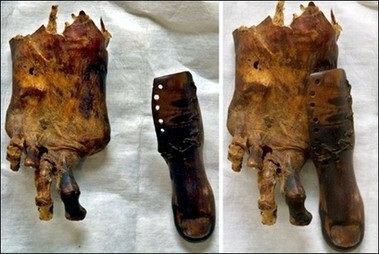 It was found strapped to the mummified foot of a 50- to 60-year-old woman who had undergone a toe amputation. "The toe dates from between 1069 and 664BC, so if we can prove it was functional then we will have pushed back prosthetic medicine by as much as 700 years," she said. Previously the earliest practical prosthesis was a fake leg made of bronze which dated from 300BC. The Roman Capua Leg was held at the Royal College of Surgeons in London before being destroyed by Luftwaffe bombs during the Second World War. Fellow Egyptologists at neighbouring Salford University are also testing a model of another fake big toe, fashioned from a type of papier-mache known as cartonnage. The linen, glue and plaster appendage too shows signs of wear which indicates the owner walked on it. However, the fact that it was not designed to bend would have made walking difficult. Ms Finch said: "The Cairo toe is the most likely of the two to be functional as it is articulated and shows signs of wear. It is still attached to the foot of the mummy of a female between 50 and 60 years of age. The amputation site is also well healed." The Greville Chester Great Toe, named after the collector who acquired it for the British Museum in 1881, will be tested at the Human Performance Laboratory at Salford University. It is possibly even older than the Cairo toe, dating from between 1295 and 664BC. "The Human Performance Laboratory will use state-of-the-art technology to test whether the replicas of the artificial toes benefit the wearer and could therefore be deemed functional," Ms Finch said. "If either one is functional it may be interesting to manufacture it with modern materials and trial it for use on people with missing toes." The Cairo toe is on display at the Cairo Museum in Egypt.